Many ex-racehorses go onto enjoy a productive second career and happy retirement once retired from racing. With so much support available from re-trainers to helplines, the journey from racehorse to dressage star can be a rewarding one. There are many considerations to make when getting started. The life of a racehorse is so different - with emphasis on fitness and speed work, so schooling is not as conventional as we dressage riders would understand it. There is so much you can aim for with your ex-racehorse and in fact any equine discipline can be explored. For the racehorse to dressage horse there's unaffiliated dressage, ROR and the British Dressage Associated Championships. The Jim Boyle's Ex-Racehorse League has been a feature on Dressage Anywhere's schedule for a number of years and we're delighted to include a 2018 series which includes an Introductory/Preliminary class and a Novice/Elementary class. Competitors can earn points each month up to the end of November 2018. 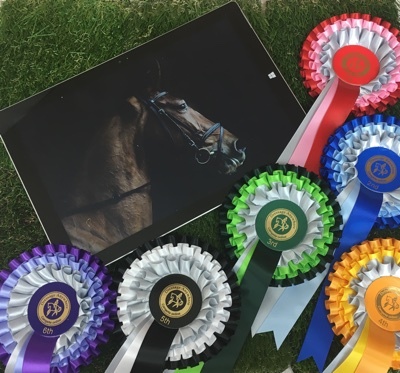 The Champion of the league will win £100 kindly provided by JIm Boyle's Ex-Racehorses plus a rosette and the Reserve Champion will win £50 plus a rosette. Our March and April Ex-Racehorse schedules are open for entries!